I’ve been working on a freestyle libre glucose monitor reader. the sensor tag uses ISO/IEC 15693 to communicate with the NFC reader. 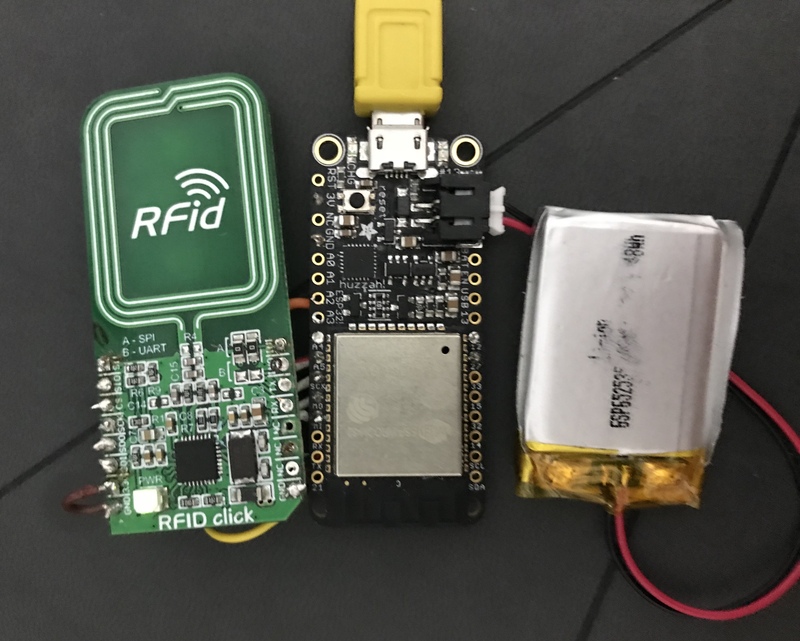 following the work of @JoernL I’ve purchased a CR95HF based reader and connected it to my esp32. the original design used arduino pro-mini, but i’ve opted to use adafruit huzzah feather esp32 as it includes all the peripherals needed: batter charger, bluetooth, and WiFi support so I can upload data to mqtt. I’ve assumed the migration, or at least the SPI connection would be transparent, but boy was I wrong. it took me several tries to figure out the pin assignment. as it turns out not all pins on the esp32 are equal. GPIO-12 is used for the boot process and should be pulled down. don’t use it. GPIO-34 to GPIO-39 are input only, and can’t be used to control other devices. 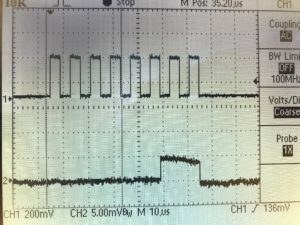 Note that SSI0 needs to be connected to “1” and SSI1 needs to be “0” at power up so the CR95HF will work in SPI mode. on some boards it is already hardwired, on mine it wasn’t. after figuring that out I’ve started implementing the protocol. there’s a lot of samples out there. it almost worked ok.
the data I got when reading from the device was shifted one bit to the left. for example if I was expecting a value of 0x4E (0100 1110 binary), what I was reading was 0x9C (1001 1100 binary) as if the SPI was missing the Most Significant Bit. 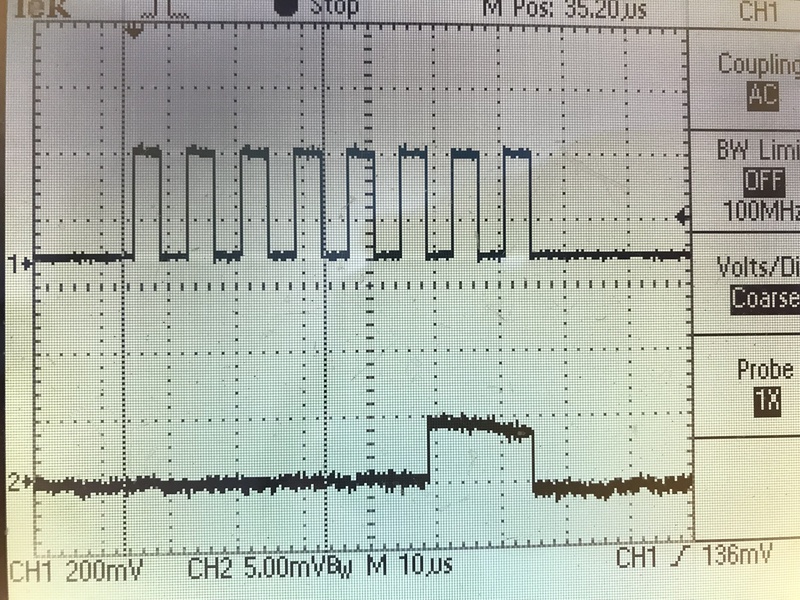 checking the signals with a osciloscope showed that the signal looked exactly as expected on the CR95HF datasheet. Due to the input delay of MISO pin, ESP32 SPI master cannot read data at very high speed. The frequency allowed is rather low when the GPIO matrix is used. Currently only frequency not greater than 8.8MHz is fully supported. When the frequency is higher, you have to use the native pins or the dummy bit workaround. Dummy bit workaround: We can insert dummy clocks (during which the host does not read data) before the read phase actually begins. The slave still sees the dummy clocks and gives out data, but the host does not read until the read phase. This compensates the lack of setup time of MISO required by the host, allowing the host reading at higher frequency. section 7.4.2 “GP-SPI Timing” has some details on why and how the data is delayed by the GPIO Matrix. and it worked ! rejoice ! knowing that someday I’ll update the SDK and I’ll forget to patch it, I wanted to move the code into my sketch. luckly the nice people at esp32 github provided the answer. spressif style is to obfuscate HAL structures by declaring the struc in the .h file and fleshing it out only inside the .c file.